If you are into cruising and never purchased the book, it is a must. If your copy is somewhat vintage, just like the ships it reviews, the book does need updating from time to time. Buy one. It is a good Christmas present as well at £18.99 and the Kindle edition is just £7.81, remarkable value. The new book is the same size as the previous one with 704 pages, but author Douglas Ward has responded to minor criticism by adding a simple tabulated ships’ rating at the back, all 275 ships individually reviewed in the 500 pages that make up the bulk of the book. Well done John. The top five large ships, rated 4-star, are Mein Schiff 4 and Mein Schiff 3, followed by the Queen Mary 2, Britannia and the Queen Elizabeth. The top five mid-sized ships, rated 4-star plus, are the Viking Star, the Crystal Serenity and Symphony, and Oceania’s Riviera and Marina. The top five small ships, rated 5-star plus, are the Europe 2, the Europa, and Silver Whisper, Shadow and Spirit. The top five so-called boutique (small) ships, rated 5-star, are the Hanseatic, the SeaDream I and II, and the Sea Cloud and the Sea Cloud II. Ward also rates ships best for families; best for teenagers; most luxurious suites; best spas; best for child-free cruising; best cruise line for foodies; and the ships with the best water slides. With each ship the guide explains who it is most suitable for, gives the history of the vessel, and describes its accommodations, dining, entertainment, and spa and fitness programs. 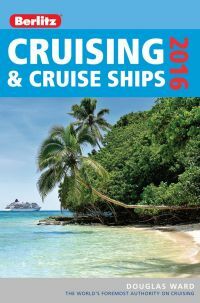 It also gives tips on how to choose a cruise to get the best value for your money; it lists extra cost items passengers should be aware of; what to expect onboard, a sample programme of a typical day at sea; and talks about what is new in 2016 – including destinations and new ships being introduced. Also covered are cruise ship environmental standards, safety and medical services. And there are practical tips, like what to do if you miss your ship or if your luggage does not show up. If you were thinking of taking one of the Queen Mary 2 Transatlantic cruises next May/June forget it. Now 11 years old (see CRUISE NEWS NOVEMBER 2009) the popular Cunard flagship is due for an extensive 25-day refit at the Blohm & Voss shipyard in Hamburg at that time. She will receive a wide range of upgrades, including 30 additional Britannia Club Balcony staterooms and 15 Britannia single staterooms, as well as a comprehensive refurbishing of all pre-existing Britannia Club Balcony cabins. There are plenty of other sailings between Southampton and New York during the year. Queen Mary 2’s redesigned Britannia Club Balcony staterooms and all-new Britannia Single staterooms will offer passengers more options and a more elegant, modern stateroom experience. Fresh design schemes and fine details will pay tribute to the original Queen Mary’s iconic art deco heritage while keeping this grand ocean-liner at the forefront of luxury. Of the 15 Britannia single staterooms to be added, nine single cabins will be on Deck 2 and six larger single staterooms will be built on Deck 3L. New single cabins on port side Deck 2 will benefit from increased ceiling height and an illuminated coffered ceiling. New single cabins on port side Deck 3L will feature two unique circular windows with bench seat cushions and a central dressing console table. It is still a long way off, but Saga plans to operate for the first time a ship purpose-built for its unique style of cruising for the over 50s. As a Plc now it is in a position to take the ‘new ship’ route, rather than as in the past acquiring, and extensively updating, a previously owned vessel. The all-balcony 55,900 tons ship, built by Meyer Werft in Germany, will come into service in 2019. The shipyard recently put the finishing touches to Norwegian Cruise Line's soon-to-launch Norwegian Escape and is building Royal Caribbean's Ovation of the Seas. The new ship will carry something less than 1,000 passengers in 540 suites and cabins. Around 15% will be designed for single occupancy and leisure facilities will include outdoor and indoor swimming pools, a spa, saunas, treatment rooms and beauty salon. Saga Cruises currently operates two ships, the 446-passenger Saga Pearl II (Berlitz 1348) and the 706-passenger Saga Sapphire (1446), both by the end of the decade ready for phasing out. The addition of the Silver Muse will expand Silversea's fleet to nine ships, and will once again significantly raise the bar in the ultra-luxury cruise market with a wealth of enhancements to the on-board experience, while satisfying the uncompromising requirements for comfort, service, and quality of the world's most discerning travellers. "We have always had a special relationship with Fincantieri, since my father ordered from them the first cruise vessels for Sitmar Cruises in 1987," said Manfredi Lefebvre d'Ovidio, Chairman of Silversea. "Both companies have a clear understanding of what today's affluent traveller seeks, and each approaches the market with originality, creativity and quality. The management team led by Giuseppe Bono has been exceptional in managing Silversea's project."